Improve the conditions for council meetings. 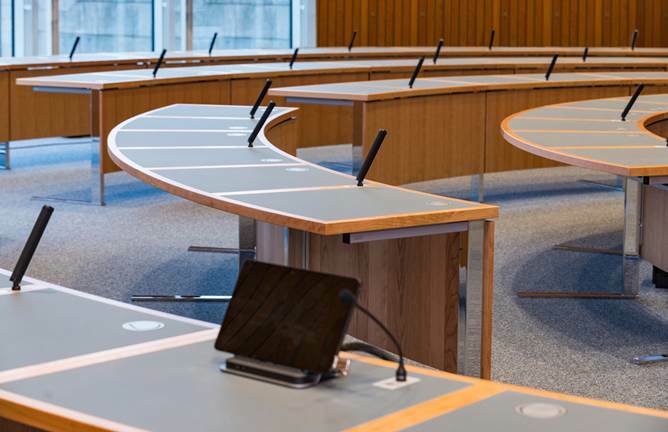 Are your customers satisfied with the current quality of your council room? Do all council members and listening citizens find optimal conditions in terms of visibility, sound, image and accessibility? As a specialist for communicative spaces, we provide you with optimal space utilisation concepts. Benefit from our experience in both historical and modern architecture. Increase the occupancy rate of a council hall. Through flexible equipment, the council hall also does justice to other forms of assembly. For example, the use of space can be increased many times over by using furniture that can be dismantled and reassembled without the use of tools. The cooperation between fröscher and the acoustics expert beyerdynamic always ensures the best sound.